My quest to create art for MAR Barker's classic Empire of the Petal Throne RPG continues - with its flying creatures! 43 backers pledged $2,620 to help bring this project to life. This project is the 14th installment of my ongoing series of projects to re-visit or re-create artwork from early tabletop role-playing games. Last time I returned to M.A.R. Barker's classic Empire of the Petal Throne RPG, I created new illustrations for the land creatures from that game - and I also created three brand new drawings of friendly nonhuman races who didn't get 'em in the original EPT rulebook. Click here to visit my DeviantArt page, where you can see lots more of my Tékumel® art! BONUS! EVERY backer will receive a PDF quick-start introduction to "Bethorm: the Plane of Tekumel", my upcoming Petal Throne RPG - in addition to their other backer rewards. BONUS BONUS! ALL backers also receive a printable tabletop 'counter' of an Aircar of the Great Ancients - one of Tekumel's most cherished technological artifacts, done in the style of my Villains & Vigilantes counters. I love Tékumel! 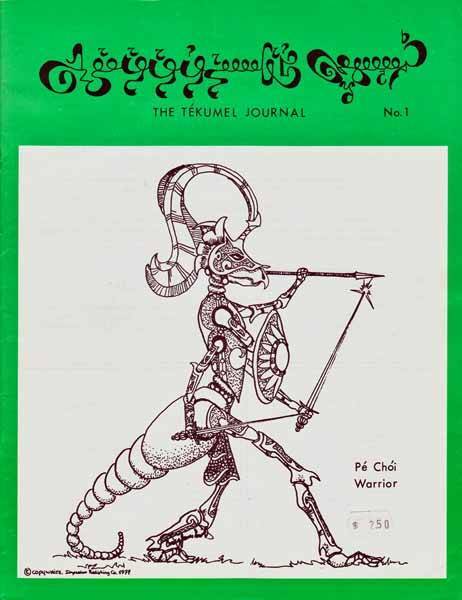 Empire of the Petal Throne was one of the first tabletop RPGs I ever owned or played, and Tékumel is still by far my favorite role-playing setting. The Tékumel artwork created in these projects will appear in my upcoming Tékumel-based RPG Béthorm: The Plane of Tékumel. If you want to try gaming on Tékumel right away, lots of material is available online to help get you started! Listen to an interview including a discussion of my efforts to re-create my lost TSR art here. All of the new artwork from these projects is posted to my DeviantArt page (jeffdee.deviantart.com) as it's completed, so you can see how they turned out. 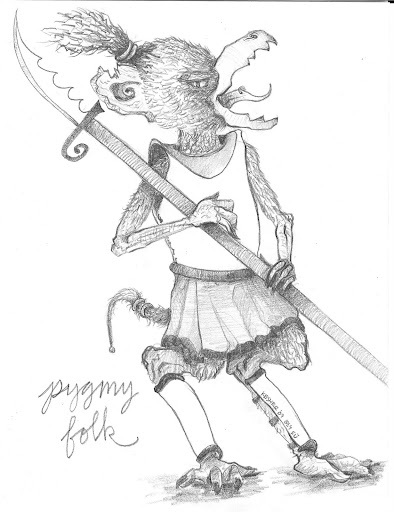 $3160: Pygmy Folk - PLUS I'll create Tékumel-themed Christmas card artwork, and make these cards available for purchase online. All of the profits from that will go to benefit the Tékumel Foundation! Where possible, I've included links to renditions of these creatures by later artists. Brett Slocum's GURPS Tékumel Conversion site also provides short text descriptions of all of these creatures and more. This project is dedicated to Talzhemir Mrr, my longtime art and game design partner, for all of her help and encouragement. Tékumel® and its related products and materials are copyright © 1975 and 2010 by Prof. M.A.R. Barker. Tékumel® is a registered trademark. Used with the permission of the Tékumel Foundation. This project essentially follows the same model as my previous Tekumel art projects. Once again I'm (1) creating new drawings of creatures from Empire of the Petal Throne, some of which have never been depicted in published worked before, and (2) I'm relying on the Tekumel Foundation for access to previously unpublished visual reference for some of the stretch goals. #1 poses no difficulty. I've drawn pictures throughout my professional career. #2 could be an issue if the Tekumel Foundation isn't responsive to my requests, though this wasn't a problem during my previous Tekumel art projects. Furthermore, many of the creatures have been depicted by artists other than Professor Barker in official Tekumel products other than the original EPT over the years, and I can turn to those for visual reference if need be. I foresee no difficulties in delivering the backer rewards for this project in January. A postcard-sized print of the new drawing of the Káyi - the Stinging Eye! A signed 8 1/2" x 11" print of the new drawing of the Vorodlá - the Flying Undead! A signed 8 1/2" x 11" print of the new Vorodlá drawing AND a postcard-sized print of the new Káyi drawing! Postcard-sized prints of all twelve of the Tékumel Skies creature drawings AND all of the unlocked stretch goal drawings! Postcard-sized prints of all twelve of the Tékumel Skies creature drawings AND all of the unlocked stretch goal drawings PLUS a signed 8 1/2" x 11" print of the new Vorodlá drawing! Own the original artwork for the new drawing of the Chólokh (the Flying Octopoid Creature). Signed, and with a certificate of authenticity. Add $60 ($185 total) to also receive postcard-sized prints of all of the original and stretch goal drawings, add $240 ($365 total) to also receive signed 8 1/2" x 11" prints of all of the original and stretch goal drawings, or add $300 ($425 total) to also receive the postcard AND signed 8 1/2" x 11" prints of all of the original and stretch goal drawings. Own the original artwork for the new drawing of the Dlákolel (the Flying Beetle-Like Creature). Signed, and with a certificate of authenticity. Add $60 ($185 total) to also receive postcard-sized prints of all of the original and stretch goal drawings, add $240 ($365 total) to also receive signed 8 1/2" x 11" prints of all of the original and stretch goal drawings, or add $300 ($425 total) to also receive the postcard AND signed 8 1/2" x 11" prints of all of the original and stretch goal drawings. Own the original artwork for the new drawing of the Gerednyá (the Flying Worm). Signed, and with a certificate of authenticity. Add $60 ($185 total) to also receive postcard-sized prints of all of the original and stretch goal drawings, add $240 ($365 total) to also receive signed 8 1/2" x 11" prints of all of the original and stretch goal drawings, or add $300 ($425 total) to also receive the postcard AND signed 8 1/2" x 11" prints of all of the original and stretch goal drawings. Own the original artwork for the new drawing of the Gíriku (the Flying Reptile). Signed, and with a certificate of authenticity. Add $60 ($185 total) to also receive postcard-sized prints of all of the original and stretch goal drawings, add $240 ($365 total) to also receive signed 8 1/2" x 11" prints of all of the original and stretch goal drawings, or add $300 ($425 total) to also receive the postcard AND signed 8 1/2" x 11" prints of all of the original and stretch goal drawings. Own the original artwork for the new drawing of the Káyi (the Eye). Signed, and with a certificate of authenticity. Add $60 ($185 total) to also receive postcard-sized prints of all of the original and stretch goal drawings, add $240 ($365 total) to also receive signed 8 1/2" x 11" prints of all of the original and stretch goal drawings, or add $300 ($425 total) to also receive the postcard AND signed 8 1/2" x 11" prints of all of the original and stretch goal drawings. Own the original artwork for the new drawing of the Khéshchal (the Plumed Bird). Signed, and with a certificate of authenticity. Add $60 ($185 total) to also receive postcard-sized prints of all of the original and stretch goal drawings, add $240 ($365 total) to also receive signed 8 1/2" x 11" prints of all of the original and stretch goal drawings, or add $300 ($425 total) to also receive the postcard AND signed 8 1/2" x 11" prints of all of the original and stretch goal drawings. Own the original artwork for the new drawing of the Küni (the Falcon). Signed, and with a certificate of authenticity. Add $60 ($185 total) to also receive postcard-sized prints of all of the original and stretch goal drawings, add $240 ($365 total) to also receive signed 8 1/2" x 11" prints of all of the original and stretch goal drawings, or add $300 ($425 total) to also receive the postcard AND signed 8 1/2" x 11" prints of all of the original and stretch goal drawings. Own the original artwork for the new drawing of the Lrí (the Flying Stinging Creature). Signed, and with a certificate of authenticity. Add $60 ($185 total) to also receive postcard-sized prints of all of the original and stretch goal drawings, add $240 ($365 total) to also receive signed 8 1/2" x 11" prints of all of the original and stretch goal drawings, or add $300 ($425 total) to also receive the postcard AND signed 8 1/2" x 11" prints of all of the original and stretch goal drawings. 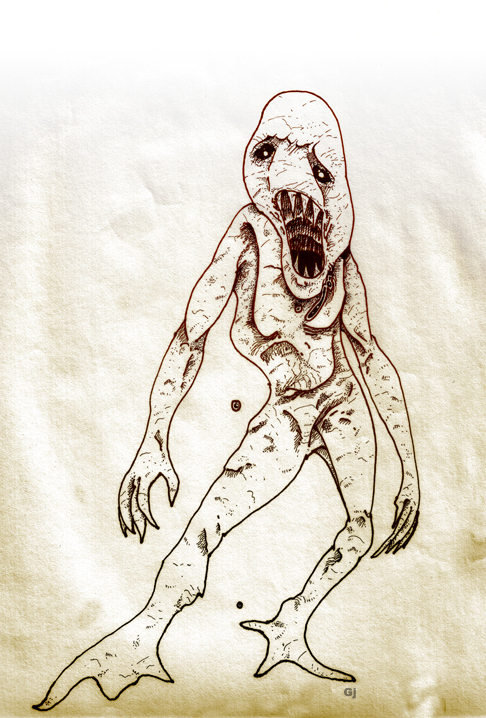 Own the original artwork for the new drawing of the Teqéqmu (the Flying Fungoid Creature). Signed, and with a certificate of authenticity. Add $60 ($185 total) to also receive postcard-sized prints of all of the original and stretch goal drawings, add $240 ($365 total) to also receive signed 8 1/2" x 11" prints of all of the original and stretch goal drawings, or add $300 ($425 total) to also receive the postcard AND signed 8 1/2" x 11" prints of all of the original and stretch goal drawings. Own the original artwork for the new drawing of the Vringálu (the Flying Snake). Signed, and with a certificate of authenticity. Add $60 ($185 total) to also receive postcard-sized prints of all of the original and stretch goal drawings, add $240 ($365 total) to also receive signed 8 1/2" x 11" prints of all of the original and stretch goal drawings, or add $300 ($425 total) to also receive the postcard AND signed 8 1/2" x 11" prints of all of the original and stretch goal drawings. Own the original artwork for the new drawing of the Tinalíya (the Gnome-like Ones). Signed, and with a certificate of authenticity. Add $60 ($185 total) to also receive postcard-sized prints of all of the original and stretch goal drawings, add $240 ($365 total) to also receive signed 8 1/2" x 11" prints of all of the original and stretch goal drawings, or add $300 ($425 total) to also receive the postcard AND signed 8 1/2" x 11" prints of all of the original and stretch goal drawings. Signed 8 1/2" x 11" prints of all twelve of the Tékumel Skies creature drawings AND all of the unlocked stretch goal drawings! Postcard-sized prints AND signed 8 1/2" x 11" prints of all twelve of the Tékumel Skies creature drawings, PLUS prints in both sizes of all of the unlocked stretch goal drawings!